i never worry about what to “do” with leftover herbs, especially cilantro. the flavour you get when you bite into a fresh leaf on its own can be pretty powerful, but you’d be surprised at how delicate it tastes chopped and dispersed among other ingredients, like in a salsa, yogurt raita, or added to simple pasta at the last minute. i find myself eating at least a cup of cilantro sprinkled over hot noodles in oil almost every time i buy a bunch. 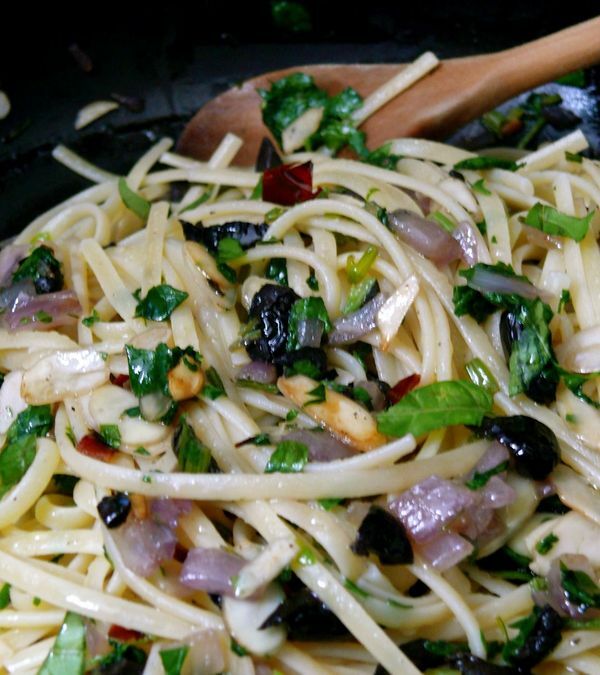 the perfect, big bite: twirl the noodles in the herb and shallot flavoured oil, scoop up the greens, crisp almonds and spear a juicy piece of olive. i try not to eat the whole bowl in under five minutes, but i know i’m still coming in at under ten. everything goes into the pan together–that has origins in my laziness, but it works well. 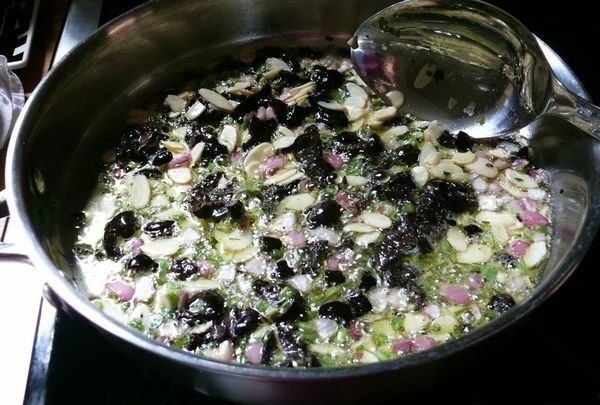 by the time the stalks and shallot cook to a pleasant softness, the almonds are perfectly toasted, the olives are fried and have contributed their flavour to the happy family too. if you prepare everything including the boiling pasta water before you start, you’ll be done in 7 minutes, just in time to put your cooked pasta into the pan, stir and serve. i’m not going to call this a quick, weeknight dinner, because i think of it more as the perfect anytime meal. think hangovers sitting on the couch on saturday morning, when you don’t want eggs, but also want to eat something worthy of the weekend, to kick it off right. once ingredients are prepped, add your pasta to salted boiling water; i prefer linguine for this dish. place a large skillet over medium-high heat. 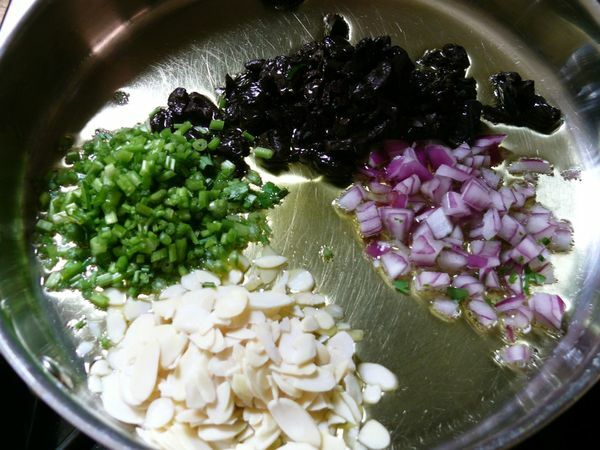 immediately add the oil, and then the almonds, olives, stems, red onion, and the chili, if using. stir well, and add the salt and pepper. sautée stirring frequently for about 5 minutes, or till the almonds just start to turn golden. remove skillet from heat and allow to cool for a minute. add the chopped leaves, a drizzle more of oil and stir well. at this point, your pasta should be cooked. add the strained pasta to the skillet and more oil if needed. toss well and serve. 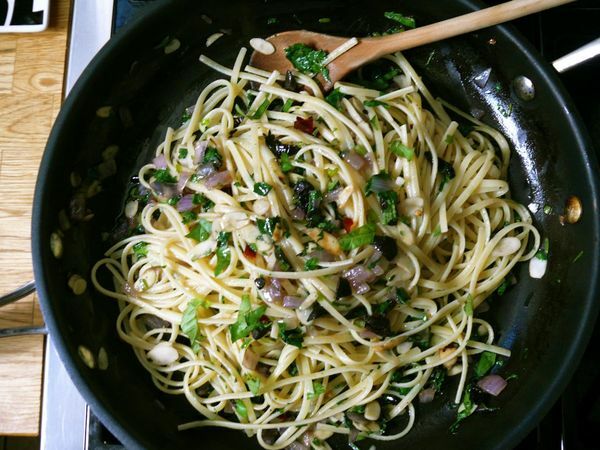 I love the use of both the parsley and cilantro in your pasta! What a great way of using them up. thanks, su-lin. 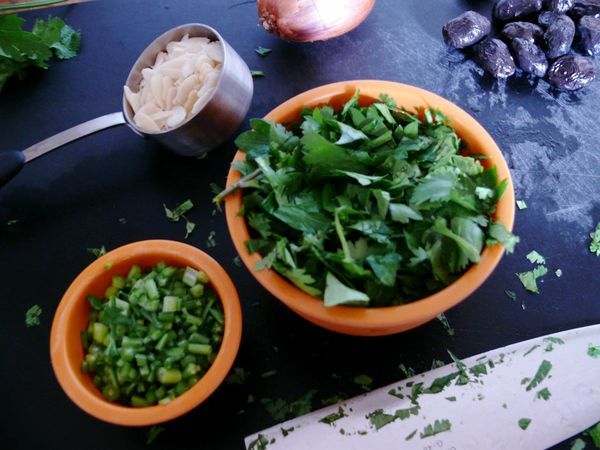 yes, i try to remember that herbs can be added to a lot of things (soups, salads, eggs) so that i dont waste them. they are too tasty to waste! Also, a friend came over impromptu and I shared this meal with him. He was really, really impressed and originally thought he wasn’t going to like it because he doesn’t like olives. But he said it tasted great in this dish. Huzzah!